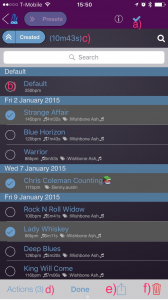 b) Presets/Playlist/Playlist Manager button. This button tells you the page you’re on. If you tap it it expands to allow you to view the Playlist or Playlist Manager page. c) Multi-select button. Tap this to select multiple Presets to perform actions on. g) Search. Tap in here to quickly search for a Preset. You can also tap the magnifying glass icon to launch search if the search bar is not visible. The image below shows the expandable buttons in their expanded form. The Presets section lists all of your saved Presets. Tap a Preset to load it and swipe back to the Metronome on the left to play it. Each Preset row displays the name in large blue letters. Underneath you’ll see the tempo, song length (if assigned) and any tags applied to the Preset. b) Tap Preset rows to select them. c) If song lengths are assigned to Presets then the sum of the lengths of the selected Presets is shown here. This is useful when creating setlists for a band. d) Actions button: Tap this to perform actions on the selected Presets. e) Share button: Tap this to share via email, messages, AirDrop or to upload to the Public Library. f) Delete button: Tap to delete the selected Presets. When you tap the Actions button above you’ll see the Actions menu. a) Manage Tags: Tap this to add tags to the selected Presets; Remove All Tags from selected Presets; Edit the Tags applied to the selected Presets. b) Add Presets To Playlist: Tap this to add the selected Presets to a Playlist. You’ll be given the option to create a new Playlist, Add to the Current Playlist, or select a Playlist from the Playlist Manager. c) Add Count In To Presets: Tap this to add a Count In to the selected Presets. 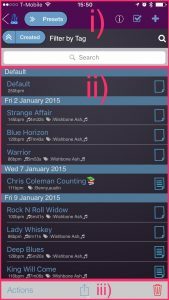 It will create a new Playlist, add the Presets, and add a Count In to the start. 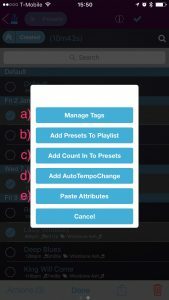 d) Add AutoTempoChange: Tap this to add the selected Presets to a Playlist and set some basic parameters to produce an automatic tempo change. You can then edit the tempo change settings in Playlist Controls.